Are our social, economic and political crises unsurmountable? 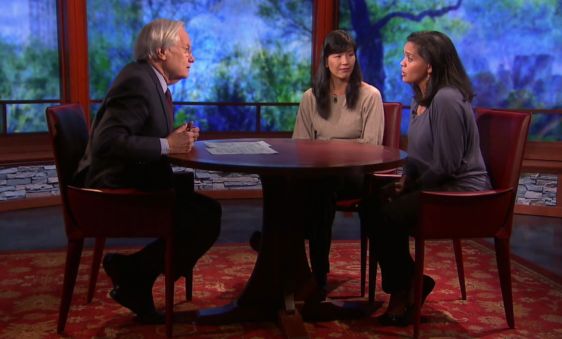 Bill Moyers talks with young but very experienced organizers George Goehl, Ai-jen Poo, and Sarita Gupta and finds out what we can do and how we can bring about change and get involved. I was impressed by the well designed interview style and by the insights the movement organisers so passionately shared about organising in the 21st century. The essence in a few words: It is about connecting the dots, connecting all the civil rights groups and movements by linking them, by co-working and collaborating on projects we care about. It can be very powerful when individuals, groups and movements that have different and diverse starting points come together and collaborate for a common purpose finding their higher shared goal. Collaboration does not mean that our different and individual starting points loose their value and importance. Instead, an appreciation of difference must be built into the collaborative working process if we are working for a healthy global community. Such a community approaches difference with curiosity and respect and builds tolerance for ambiguity into the process of community building rather than competition. We can only really understand our individual place and what part we can play in the bigger scheme of things when we play together like a powerful orchestra that includes and transcends what every single player brings to the shared performance. The added value is that by working together in this way we can create uplifiting and inspiring experiences for others. 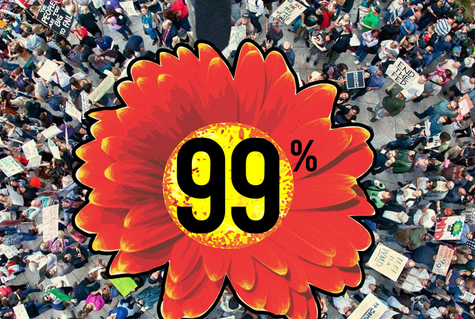 Organisers of the 99% Spring aim to train 100,000 Americans to teach about income inequality in homes, places of worship,campuses and the streets. Government no longer fixes thingsfor us. It resonates strongly when they say: We need to organise ourselves differently and collaborate . The broadcast by BillMoyers.com is titled: Moyers & Company Show 112: Standing Up For Democracy. Questions raised included: What are the new techniques and new values that change the world of organising and that enable us to find the longterm systemic solutions that we need? Answers to this question are interesting to all social change movements anywhere in the world although particular issues affecting local populations may vary to some extent. The world of organising and the world of politics is going to be increasingly reflective of the changing demographics especially in the western world with a large immigrant population. More leadership will come from women, from different ethnic groups and from those suffering most under the enclosure of our Commons. Towards the end of the broadcast (48:51) the issue of airwaves as commons is raised. In theory no private enterprise should be able to buy and control our airwaves but in practice news channels are controlled and inaccessible to those whose voices need to be heard. We are robbed of our airwave highways and need to reclaim them. We will do that by working together and by putting our bodies out on the line in the name of a new economy according to the organiser of the 99% Spring . Georg Goehl is a 99% Spring co-organizer. He is executive director of National People’s Action, a network of grassroots organizations using direct action to battle economic and racial injustice. Ai-jen Poo, director and co-founder of the 10,000-member National Domestic Workers Alliance, led the fight for passage of The Domestic Workers’ Bill of Rights in New York State, the first of its kind in America. Sarita Gupta is executive director of Jobs with Justice, a labor organization in 46 cities and 26 states working to create a broad, global movement for economic and social justice. Poo and Gupta are also participating in an economic campaign for domestic and homecare workers of all ages called Caring Across Generations. This is an excellent interview/ discussion… if one is on the fence about the integrity and possibility embodied in the Occupy Movement, watch this! It is obvious to me that young people will lead this system transformation… they are less invested in the status quo and can see clearly this system has to go. With the help of experienced activists and progressives like Moyers, the tide will soon be turning.